Hey readers! It’s time for me to reflect back on the books I read in May. May was full of lots of activities and Bank Holidays here in France, but I still got five books read. Yay me! The first science fiction novel by a black female author, this is a time travel story with an uncomfortable twist. Dana, an African American living in 1976 is repeatedly called back to 19th century antebellum south to save the life of a young white man. Butler doesn’t hold back on her descriptions of life on a plantation, and it’s interesting to see how Dana deals with, and analyzes becoming a slave. One can’t help but wonder why Dana continues to save the life of Rufus, even though he is her ancestor and his death would mean that she would no longer exist. I knocked this out in a couple days, I didn’t want to put it down! I’d already read this book as a teen but wanted to reread it given the current political climate. It’s quite harrowing in its description of a regime built on hate, propaganda and the complete suppression of individual autonomy. Imagine having to even be careful what you think in case the mildest flicker of a facial expression gives you away. Anyone, even your own children, can turn you in for the tiniest infraction (real or imagined). Somehow in the midst of this Winston and Julia fall in love. We know they are doomed, even though we keep wishing for some kind of miraculous happy ending. Probably the most complicated book I’ve read so far this year. I totally loved this story which I bought on a whim after reading that it was inspired by Parnassus on Wheels, which I read last year. Nina is a librarian who is happy choosing the perfect books for readers. Then the library is closed and Nina has to choose between a soulless job at a media center, or chucking it all to buy a van and turn it into a mobile bookshop. Luckily for us she chooses the latter, and heads off to Scotland to ply her wares. Oh and it’s also a love story (of course). If you love reading about books you’ll love this story. It’s a quick, fun read, and will make you want to head to the Scottish Highlands immediately! This was described as Eleanor and Park meets The Faults in Our Stars, and the description is apt! Violet, a popular high school senior and Finch, commonly described as weird or a freak by Violet’s friends, never expected to have anything in common. They meet unexpectedly high on their school’s bell tower, and then end up working on a school project together, discovering the unique things about Indiana. Violet is in the process of mourning her older sister’s death, and Finch is struggling to “stay awake”. They fall in love despite numerous differences: Finch’s family seem to care little about him, while Violet has very cool and involved parents. It’s a tough story to read, but so beautifully written that I couldn’t put it down. even as I dreaded what was going to happen next. A friend passed this on to me, and I wasn’t too sure what to expect, but I really enjoyed this very real collection of short stories. Each story deals with a woman going through difficulties, and explores themes such as mental illness, lesbianism, alcoholism and motherhood (or lack thereof). It’s also set in Scotland, which meant the occasional Scottish hilarity and vernacular. 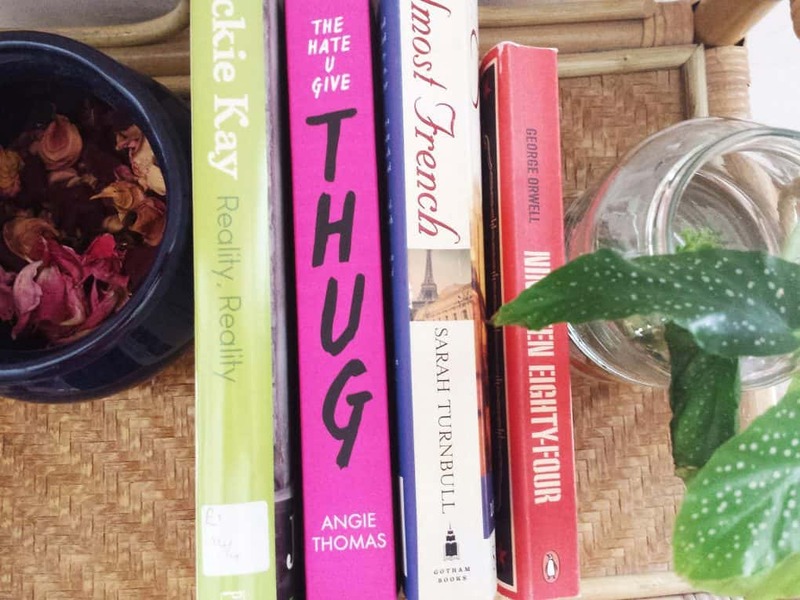 Head over to see what Vernell read in May. Don’t forget, we’re relaunching the Sister Reads book club with The Hate U Give this month. Get more deets in the Facebook group.